The faces on U.S. bank notes are so ubiquitous that we barely notice them anymore. 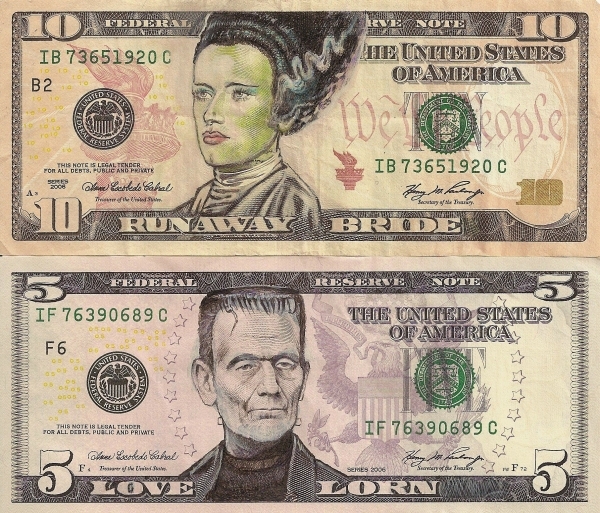 But San Francisco-based artist James Charles is intimately familiar with the intricacies of U.S. currency portraits. Charles is a mixed media artist with an array of talents, one of which is illustrative portraiture. By sort of a happy accident — he began drawing on dollar bills for fun… what he calls “self-amusement” — Charles altered presidents’ faces in all sorts of ways. Before long, he had an incredible series that continues to grow. His attention to detail is nothing short of incredible, even modifying the lettering along the bottom of the note with the title of each piece. The subject matter ranges, which is part of the brilliance of this series as a whole. Though he never explicitly states it, Charles seems to be using his art as commentary for how pop culture is such a driving force in American economics today.